When Corey Glover of the band Living Colour was a guest on VH1’s That Metal Show, he told the story of seeing James Brown perform live at The Apollo. Only twelve years old at the time, the performance was such an overwhelming experience that afterwards, Glover started setting things on fire. At the age of ten, I had a similar experience. With Stephen King. Before I continue I would like to clarify that Stephen King did not make me set things on fire. However, my first encounter with his books did affect me in such a way that for years he was pretty much the only author I read. The first book by Stephen King I read was Cujo. Cujo is a story that centers on a rabid dog of that name. To me, the scariest part of Cujo was not the dog, but the wardrobe in the bedroom of a boy named Tad. The reason why it scared me is because while I was reading Cujo, the door to the wardrobe in my room was broken and hung slightly off its hinges, reminding me what was going on with Tad. The memory of the wardrobe in Cujo is how the ten-year-old in me remembers it, which means that it could be inaccurate. But although I am a person who regularly rereads books, I have never read Cujo again, and I doubt I ever will. At age eleven, the first book I bought with my own money was Stephen King’s Salem’s Lot. I bought Salem’s Lot in an airport before going away for the holidays with my family. Since then, whenever I go on a trip, I buy myself a book. I’ve even developed a set of guidelines on how to choose the book that will be my traveling companion. The book I have read the most times is Stephen King’s The Stand. Throughout junior high and high school, I read The Stand at least once a year. Because of Stephen King’s Pet Sematary, I have problems spelling “cemetery” properly. 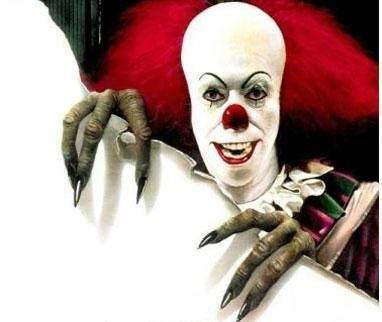 Because of Stephen King’s It, I’m not too fond of clowns. I don’t suffer from coulrophobia, but if you ever attend a party at my house, I can guarantee you that the party will be clown-free. Because of Stephen King, horror movies don’t scare me. There is nothing a horror movie director can do to me that Stephen King hasn’t done already. Has an author ever affected you in the way you lead your life?